Slacker joins Apple and Microsoft in releasing new models: It's been a busy week for those who follow the latest developments in music players. Apple's new iPods, while not revolutionary, still up the ante for features and quality; Microsoft's new Zunes, released today, come with fascinating new software options; and the Slacker G2 today. 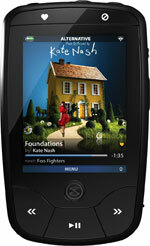 The G2, like the iPod touch and all Zunes, sports Wi-Fi. Slacker licenses music directly from publishers, and includes a perpetual subscription in the cost of the player. Slacker creates stations that feed out an endless supply of music. The new models are $200 for a 4GB model with the ability to list 25 stations (up to 2,500 songs), or $250 for an 8 GB model with 40 stations (up to 4,000 songs). You can also sync your own music in MP3 or WMA format. For $7.50 per month, you can upgrade and store songs you're listening to, as well as avoid ads. The G2 is already getting reviews as a much-improved upgrade from the first release. Like the Zune, there's no browser or other Internet features, and that might be a positive. The G2 is tied into Devicescape's Wi-Fi home and hotspot authentication system, which lets Slacker G2 owners pre-program encryption keys or login information for hotspots that they frequent. Devicescape's software both retrieves and stores login information, allowing the G2 to be used in places that would otherwise require either tedious entry of a WPA passphrase, or be unavailable without a Web browser to handle the login.